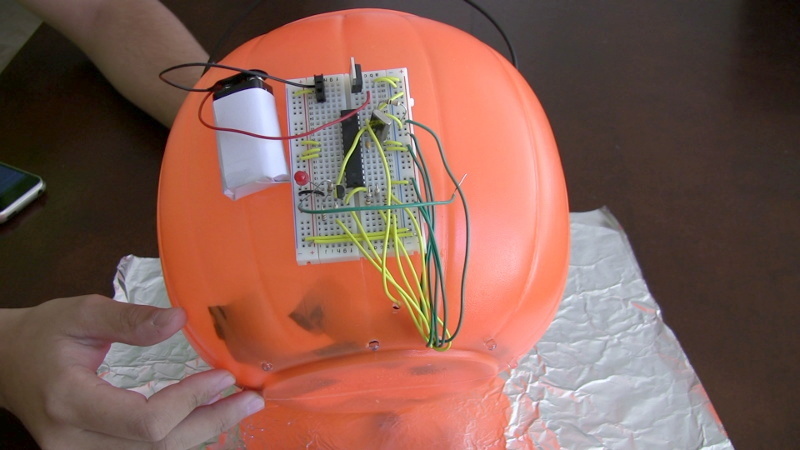 I did the pumpkin tutorial this weekend and I had some issues wiring it, but specifically, what is the resister that is connected to ground that looks like it is coming out of the 2N7000 base for? Are you talking about the capacitive proximity sensor? I don't see a resistor connected to the base in the schematic. Yes, I am talking about the capacitive proximity sensor.. (I should have grabbed the real title.. thanks). And yes, I didn't see a resistor connected to the base in the schematic either, but if you look at this picture: You can see a resistor next to the green wire that looks like it is going to the 2N7000 base pin (I think).. Maybe on the breadboard in the picture at location 9I to GND? I believe the resistor you are referring to is a pull up resistor. It is not necessary for the circuit to work, it is there to define the voltage at the gate of the transistor when the chip hasn't turned on yet (or is not actively driving that pin). Ok, that works for me. Not needed is fine. I am done with the pumpkin now. It works pretty well. The only thing I have found is if you quickly stick your hand in and out then the LED's will get dimmer and dimmer and eventually not work. If you wait a few seconds the average will get reset and it will work fine again.